"Singh’s illuminating study shows the power of economic discourse to shape theology, while also demonstrating that one of the reasons theology is able to alter economic practice is precisely that it does not stand outside economic thinking." Divine Currency: The Theological Power of Money in the West. Cultural Memory in the Present. Stanford University Press, 2018. This book demonstrates how economic ideas structured early Christian thought and society, giving crucial insight into why money holds such sway in the West. Examining the religious and theological sources of money's power, it shows how early Christian thinkers borrowed ancient notions of money and economic exchange from the Roman Empire as a basis for their new theological arguments. Monetary metaphors and images, including the minting of coins and debt slavery, provided frameworks for theologians to explain what happens in salvation. God became an economic administrator, for instance, and Christ functioned as a currency to purchase humanity's freedom. Such ideas, in turn, provided models for pastors and Christian emperors as they oversaw both resources and people, which led to new economic conceptions of state administration of populations and conferred a godly aura on the use of money. Divine Currency argues that this longstanding association of money with divine activity has contributed over the centuries to an ever increasing significance of money, justifying various forms of politics that manage citizens along the way. Devin Singh's account sheds unexpected light on why we live in a world where nothing seems immune from the price mechanism. "Divine Currency offers an incisive contribution to the debate about neoliberalism's Christian origins. Devin Singh's bold reading of the sources challenges us to reconsider the relations between theology, politics, and economics." 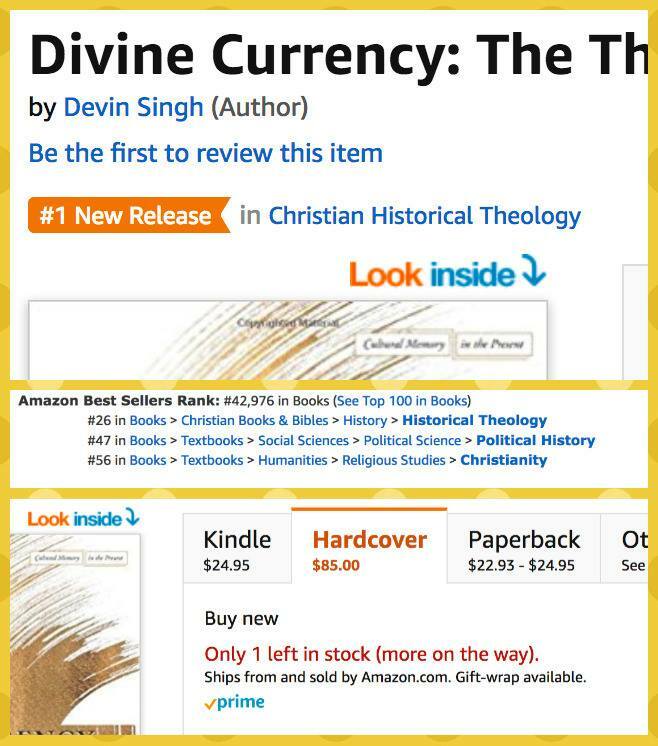 Devin Singh's scholarly work has appeared in journals such as the Harvard Theological Review, Implicit Religion, Political Theology, Journal of Religious Ethics, and Studia Patristica. Most of these are available for access at his Academia.edu site. Singh's popular writing has appeared in Time, The Huffington Post, LA Review of Books, and Patheos. Time Magazine: Is Donald Trump a Tyrant? Protestant Work Ethic, On a Tuesday?